Florida has been experiencing a rain deficit for several weeks. It isn't unusual for May. Still we wish for those occasional showers to lessen the burden on our plants. Recently I posted a view of Helen's (my neighbor) amazing display of rain lilies that burst open in all their glory following the last brief rain we had. Nothing really compares to seeing them en masse as she grows them. This week only days after an unexpected (albeit brief) relief from the dry spell my own small patch of rain lilies (Zephyranthes grandiflora) decided to wake up. It's a sure thing. You can count on it. Opening slowly but fully as the morning wanes and lasting only about 48 hours. Until the next round of buds seemingly shoots up overnight after another good rainshower. All summer long we can expect to see them. A cheery grouping in a sunny location. This patch is sited on the southside of the pool cage and catches my attention easily from the back porch. They always bring a smile to my face. those are so pretty. 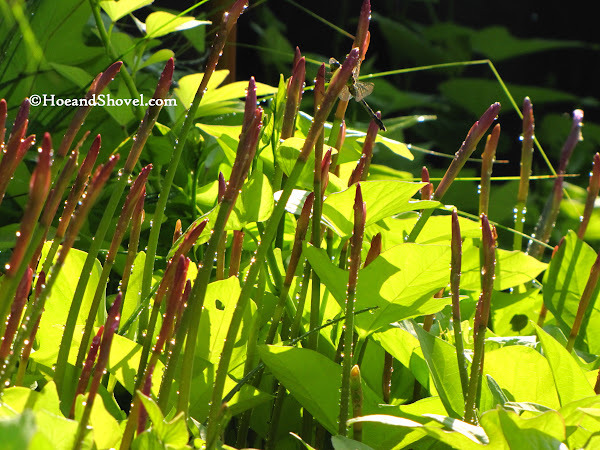 Often it is the plants that give just a fleeting glance of their beauty that really catch our attention isn't it? They seem to be saying - pay attention now or you might miss us! Hey Meems do you want me to visit? Remember the first time I visited your garden it rained cats and dogs just after I left you. Here it is thundering up with dark clouds but no rain as yet. We had a nice shower yesterday and I am hoping we get some tonight, not too much though. Take care my friend hugs. 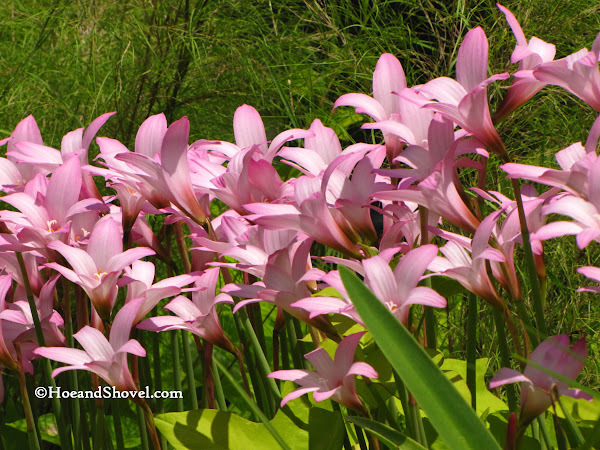 Your rain lilies are gorgeous!! 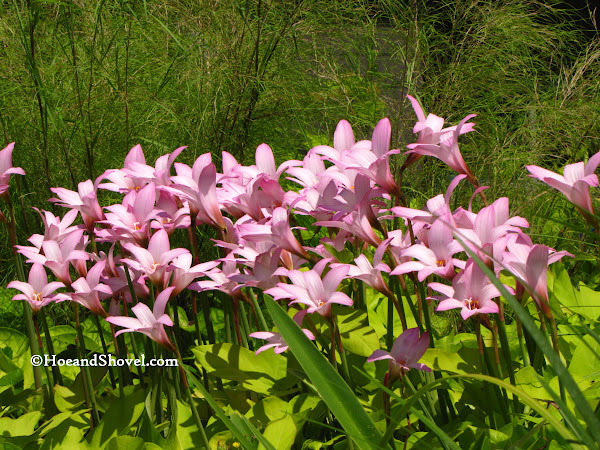 This morning when I was riding my bike I saw an equally amazing display of rain lilies. It continues to remind me that I do need to find some seed. Hope we get more rain soon. I can't decide if they're more amazing before or after they bloom! What a beautiful shade of pink! I will have to put these on my list. Anything that enjoys the rain as much as I do is worth investing in! 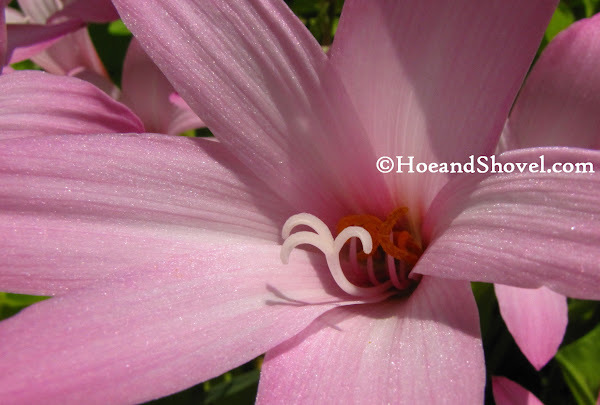 I love rain lilies. Your patch is lovely. Unfortunately for us, we are in extreme drought conditons so no rain lilies bloomin. I do hope we get some much needed rain soon. Hi Meems. Those are so pretty. I must find some seed or bulbs of it. I really like that shade of pink. Does it like sun or shade? Much to my surprise my rain lilies boomed on Sunday as well!!! I agree it is a joy to see them blooming again!! Hopefully they harbor more rains to come!! My lilies are on the east side of the pool cage and get lots of sun. 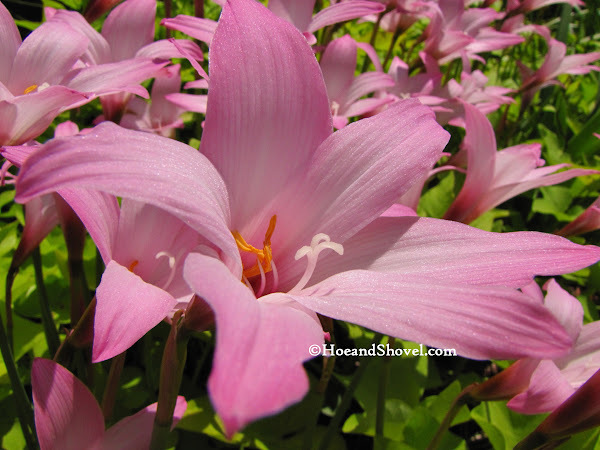 Beautiful pink Rain lilies! Absolutely beautiful flowers.